“I find the Indian audience more receptive to our music, when compared to the audience at home,” says Aurora Jane, tucking into a late-afternoon snack in her room at the Park Hotel, Kolkata. This is her last day in India after a three-week tour in the country to launch her album, Deep End. “You see, the Australian audience has no dearth of options for gigs like ours. In fact, you can catch 60 live shows in one night in a city like Sydney or Melbourne. In India, we are a relatively new sound,” she continues, in between mouthfuls of mushrooms, wondering why she got a gigantic croissant, when she had, in fact, thought she had ordered a pie. Aurora Jane. Photograph by Nupur Barua. The official Deep End launch took place at Blue Frog, Mumbai, on February 9. Her India 2011 tour, however, began with a gig at Attitude at Gurgaon, a few days prior to the Blue Frog event. “I planned most of this tour myself, given that my knowledge of Indian geography has improved considerably, after so many visits,” Jane admits. This is her sixth time in India, and she feels strongly connected to the people in this country. “I have made many good friends here,” she adds. From Mumbai, the band went on to play in Bangalore, Pune, Shillong, and Kolkata. Accompanied by Mal Webb on horns, backing vocals, and trix, Tim Bennett on bass and backing vocals, and Ben Karsay on drums, Jane played most of the songs from the album, but managed to insert a few old favourites as well. Her typical set list consists of about 13 songs, to be performed within an hour, plus the encore. The list includes solo performances by Mal Webb and Tim Bennett, too, both successful musicians in their own right. Mal Webb is, in his own words, “a vocal adventurer, songwriter, and multi-instrumentalist”, who entertains the crowd. His sideways yodeling has gained him a few more fans to add to his ever-increasing throng of admirers. At Blue Frog, Mumbai, his song on acronyms, ‘U.R.F.U.S.’, kept the audience in splits. Mal introduced his D.V.D., Live and Instructional 2007-2010, on this tour. It was his first time in India, and he seemed rather fascinated by Indian trucks that carried the message, ‘Blow Horn’. Aurora Jane at The Park, Kolkata. Photograph by Nupur Barua. Tim Bennett and Ben Karsay are used to travelling in India now. They love the people and the energy here. Tim’s solo, a Central African song titled ‘Jumula’ was an instant hit with the crowd at Someplace Else, Kolkata. “Ben and I will aim to bring our own music on the ‘Spearchill’ label we created to India with us for our next visit later this year,” Tim says, when he finally strolls into Jane’s room, with sleepy eyes and loose dreadlocks. “India is like a second home for me, after five trips to the sub-continent now, I feel so welcomed and at ease. The world family is growing!” he adds. With the music written on bass, Deep End has more than just potential. It connects with the listeners on various levels. It is a whole new sound, but familiar and somewhat nostalgic at the same time. 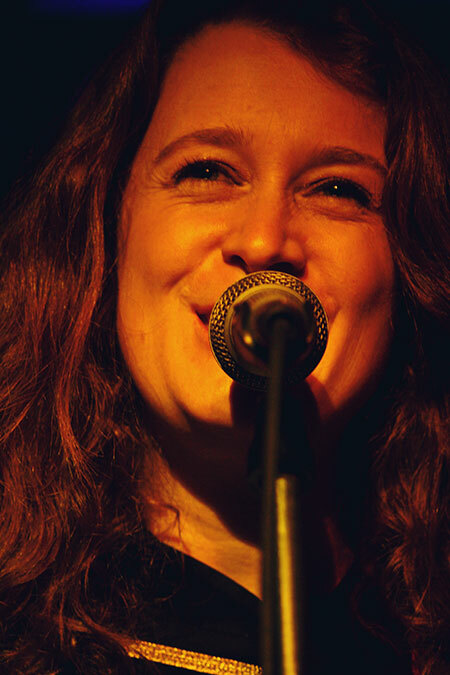 It took Jane two years to complete this album, recorded in India, Canada and Australia, and mixed in Sydney. Deep End presents a collision of funk and rock, and takes the listener on a joy ride through some of the most upbeat compositions ever by an Australian band. “I spent a lot of time at home, in the studio, travelling, and I collated all these experiences to make this album. Deep End is also a good representation of all the four years that I was practically homeless, a nomad,” she declares. Dressed nattily in black, the members of the Aurora Jane band are not your usual head-banging, screeching, wild performers that one would expect in a ‘funk/rock show’. According to Ben, “My mum brought me up to be a gentleman, and that is how I behave, wherever I am.” Jane believes in lending a certain dignity to the stage she stands on, which does not mean that her band members do not have fun while they are at it. It is this refreshing lack of narcissism that allows the audience to appreciate the music and lyrics better, and makes each gig a unique memory. Jane played most of the songs from the album, and also introduced the other members of the band, and some of their work. Dhruv Ghanekar, of Drona and Chakraview fame (also musician, guitarist, and songwriter), accompanied her on stage at Blue Frog in Mumbai. “Dhruv features on Deep End on two tracks, ‘‘Til I Die’ and ‘Happy’. We recorded at Blue Frog, and during those same sessions, Vivek (Rajagopalan, composer and percussionist) added percussion to ‘Home’,” Jane says. 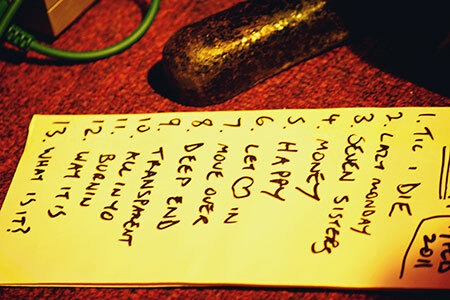 Aurora Jane’s set list in Kolkata. Photograph by Nupur Barua. “We are yet to collaborate with Soulmate, but I sincerely hope that we get to tour together in the near future and collaborate both on and off stage in the studio,” she adds. Soulmate is a band from Shillong, led by songwriter and singer Rudy Wallang. Jane and her friends have a soft spot for northeastern India in general and Shillong in particular. One of her earlier songs, ‘Seven Sisters’, is a dedication to the people of that region, and remains one of the most popular numbers in her shows. The song deals with identities and recognition (‘We have stories of our own’), subjects close to Jane’s heart, especially after her experiences with Australia’s Indigenous people and their music. Besides her live shows and mini-vacation in the northeast (where Mal discovered how a dosa is made, and where they chilled out, literally), Jane collaborated with Vinod Shetty of Acorn Foundation India to conduct a music workshop for the kids of the Dharavi slums. “I have always wanted to do something beyond the usual stuff in India, something that makes a difference, and grabbed the chance when I got it,” says Jane. The day before their Blue Frog show, the band, along with Vinod and singer Suneeta Rao, spent an entire afternoon with these children, at Mahim Nature Park, Mumbai. Language seemed to be no barrier, and the visibly excited kids tried their hands at percussions (on plastic barrels), and at singing in both Hindi and English, and also took some beatboxing lessons from Mal. The emphasis on making music with the body, or body percussions, was the highlight of the afternoon, and the children were thrilled with Mal’s antics and their own ability to mimic him. The band documented the event and also recorded the singing and excited chatter, to use as background in a song they plan to record later. The visibly excited kids in Dharavi took some beatboxing lessons from Mal Webb. Eight of these kids were chosen to perform with Aurora Jane at Blue Frog. Wearing their ‘Dharavi Rocks’ T-shirts, they sang ‘Music in everything… sab kuch mein sangeet hain’, after a round of rehearsals in a dark courtyard behind the venue. Some of the children had a few tricks rehearsed to show off to Mal, who was suitably impressed. Two of the boys accompanied Ben on plastic barrel drums. Conducting workshops like these may become a regular feature of their Indian tours, Jane hopes. Aurora Jane will be back in India later this year, possibly in November, for yet another tour in the country that they have made their second home. Until then, all of them, especially Tim, are learning how to deal with their ‘paneer withdrawal symptoms’, as they embark on their Australian tour of Deep End. Nupur Barua holds a post-graduate diploma in journalism, content creation, and media management. She rather unwisely gave up a career as a journalist to pursue another in the world of fiction television. After attempting to understand the industry for six years, she finally gave it up to return to her first love—writing! Currently based in Mumbai, Nupur provides content and edits on a freelance basis, and occasionally designs presentations for movie and television pitches. She is also an amateur photographer with a love for travelling and animals, and is constantly looking for more material to add to her blogs. By Urvashi Bahuguna · Aditi Rao, winner of the Srinivas Rayaprol Poetry Prize in 2011, speaks to us about her writing. By Nicole Newby · Bestselling author Meenakshi Reddy Madhavan speaks to us about her latest novel Cold Feet and why she dislikes the term 'chick lit'. By Urvashi Bahuguna · In conversation with author Nilanjana Roy about her latest book The Girl Who Ate Books, traditions, final drafts, and the tragic side of plagiarism.